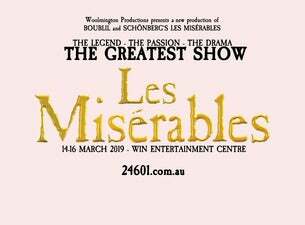 The legendary Les Misérables is a global stage sensation, more than 70 million tickets sold in 52 countries and staged in 22 languages around the world. This entirely new production brings the show to its biggest stage yet with a cast, crew and orchestra of more than 100 artists. This glorious new staging and dazzlingly re-imagined scenery inspired by the works of Victor Hugo, will leave you awestruck. Featuring the thrilling score and beloved songs “I Dreamed A Dream,” “On My Own,” “Stars," “Bring Him Home,” “One Day More,” and many more, this epic and uplifting story has become one of the most celebrated musicals in theatrical history.